After a slightly shaky start, I enjoyed this book a lot. Lauren Gregory certainly knows how to keep a reader turning the pages, and I was engrossed for nearly all of it. 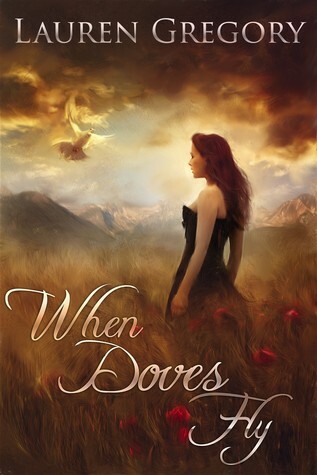 When Doves Fly is the story of Lily Wright, fleeing tragic family circumstances and a brutal husband, in the days of the Wild West and people striking out to make their fortune via the gold rush. A woman alone, she struggles to make a living in the boom town of Clear Springs, Colorado, and her fortunes rise and plummet at every turn. There are some good plot developments in this story, completely unexpected, and the atmosphere of the time and situation is spot on. One of the biggest strengths in this book is the characterisation. The dialogue of characters as Jessie the prostitute, the evil Silas Barnes who is out to ruin Lily, wise old girl Alice Durand (I loved her, my absolute favourite character) and the miners visiting Barnes’s brothel is so very good, I kept silently applauding little bits. When Alice was telling Lily the story of her own past, I think I was as anxious as Lily to find out all about her! Ms Gregory knows how to write a Texan accent, a Scottish one, and many others, so incredibly well (but without being overdone) that I was reading it in the accent intended—excellent, I bow with respect! There were a few negatives for me, though others might not agree, and they’re not big ones. I found the beginning, when Lily arrives journeys to and arrives at Clear Springs, a tad unconvincing and a little rushed through; I didn’t get into the story until it went back in time to Charlotte’s situation. Lily’s thoughts being actual dialogue in italics grated on me a little: ‘What in heaven’s name was I thinking? I’m so dense!”, etc. I thought this would have been more effectively written as an inner third person narrative, ie, ‘what in heaven’s name was she thinking?’. There’s probably an actual name for the style of prose I mean, something like free indirect speech, I think, but I’m not sure. The only other slight negative was that the last 10-12% seemed a trifle too neatly wrapped up; I was expecting another twist and was disappointed when it didn’t come, but, hey, this is Lauren Gregory’s book, not mine. So a bit of an anti-climax for me, but it was still well written and convincing. To sum up: When Doves Fly is a cracking read, I’d recommend it to anyone who likes these sort of stories. I will definitely read another book by this author, a master storyteller who really knows how to spin a yarn! Interesting story and great review. I love a good dialogue. Thanks, Terry!